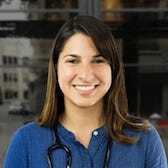 Having spent 8 ½ years in emergency medicine, Millad Mohlenhoff decided to make the switch to primary care so that she could build more ongoing relationships with her patients, who would frequently ask her if she could be their primary care provider. Millad moved to the bay area at age four as a refugee from Iran. Growing up as an immigrant taught her to work hard and how little kindness there was in the world and she was determined to change that by entering the healthcare field. One of her first jobs was working at the same refugee medical clinic that welcomed her. She eventually became an EMT after receiving her Bachelor's Degree at UCSC in Molecular, Cellular and Developmental Biology and after two years as an ER technician, she went to receive her Masters degree in Physician Assistant studies at MCPHS. Millad lives in Pacifica and enjoys backpacking, hiking and recently took up kickboxing.